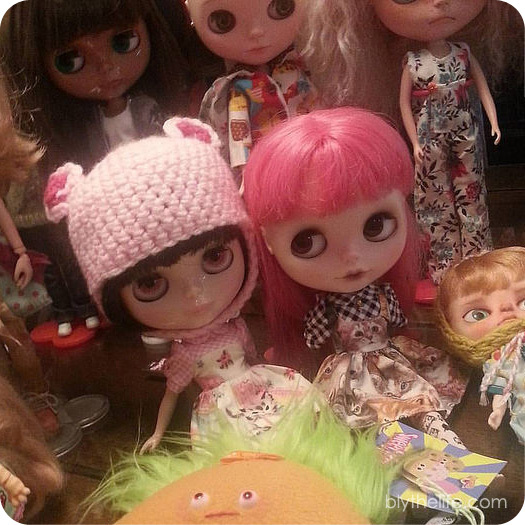 This past weekend, I went to a Blythe meet with my amazing and wonderful local group of dolly friends – if you had attended BlytheCon Vancouver you probably would have met most of them! It was our first doll meet following the big event that happened on August 9th. Can you believe that it’s been over a month and a half since BlytheCon Vancouver? I can’t! It was a whirlwind of excitement (and stress) that led up to the Big Day! I had a lot of fun with the day and got to talk to so many amazing people – it’s always great being able to put names to faces. I always associate people’s names or usernames with their avatars, and a lot of people use photos of their Blythes so I don’t know what anyone genuinely looks like half the time! Eden Mouse’s wearing: helmet/chelleshocks, dress/Plastic Fashion. Cameo’s wearing: dress/Plastic Fashion, leggings/Endangered Sissy. The most curious thing happened though. I saw all these great dolls – stock and customs, in amazing fashions and shoes and I didn’t find myself wanting to add another doll to my family. I also didn’t see any clothes and really want to dig into what the maker was and, gosh, could I just buy it? I have been collecting and amassing dolls and dolly thing since 2009, so just over six years now. Have I finally reached a point where I’m content with the dolls that I have? While I’d still love to add a BL to my collection (because, let’s face it, it’s the one Takara-made mold face that I’m missing), it’s not a pressing want right now. This may also have to do with my lack of spending money, but let us not quibble over facts. It is a bit of a novel feeling because I have, for the most part, always wanted new dolls, or new clothes or shoes for dolls, and it’s a bit weird to honestly not be actively wishing for a money tree so I can buy All The Things! I’m happy with the dollies that I have, and it is an odd feeling. Are you content with what dolls you have? I know I’m happy with how my doll collection is right now, but I also know my doll wishlist is still quite long. While I fully intend to add more members to the family, I don’t feel the need to rush into any purchases at the moment. I’m still longing for a Middie, but I’m just waiting for the right one to appear. I only have three Blythes and one Middie. I recently started collecting Pullips too, and I love them but they aren’t very sturdy. I want a few more girls yes! I want a Kenner and at least one adorable custom that is super well done. (At least $1000) omg! I also want more Pullips including some boys. I need a JerryBerry too. I must stop now. I’m new to the Blythe world and started collecting dolls in the Spring. My 12 year old daughter has abandoned her American Girl dolls and joined in the fun too. We have 8 between us but 3 are factory dolls. My prize and most loved is Curly Blue Babe. We would like to get a Middie but we are holding out for the new one coming in November, Mary Ann. I would still like to learn more about the Kenners and other styles. This is a very addicting hobby. I am grateful for this blog because I’ve learned so much from all the articles and comments. I’m glad I have reached a happy place for the moment. So is my budget!